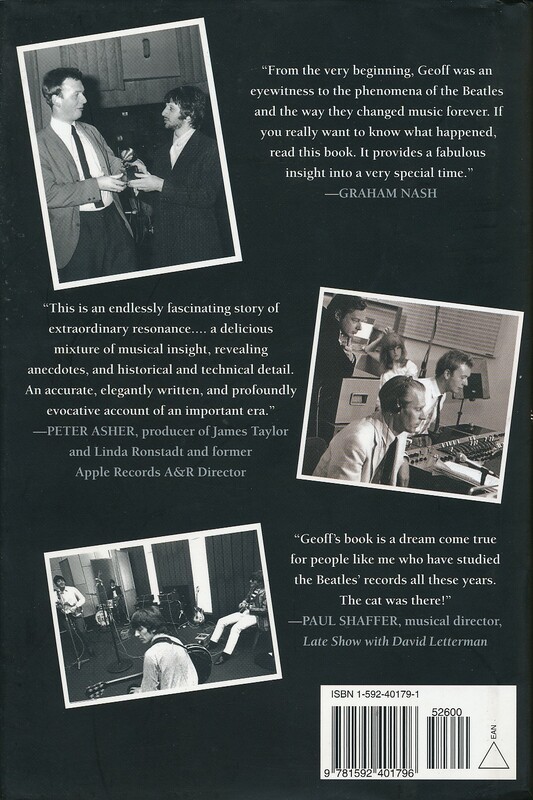 We recently purchased a nice, used hardback copy of Geoff Emerick’s fantastic Beatle book Here, There and Everywhere – My Life Recording the Music of the Beatles. Not having read it before it’s currently our favourite, especially given the release in the last week of the The Beatles In Mono vinyl LPs as a boxed set (and also as individual albums). Geoff Emerick was George Martin’s right-hand man in the control room at EMI’s Abbey Road studios in London. At the age of 15 (on just his second day at EMI) he was present – as an assistant recording engineer – when a scruffy-looking quartet from Liverpool came in for their very first studio session. Emerick progressed from that recording (“Love Me Do” in 1962), to being directly involved with the majority of the band’s classic albums. He confirms on a number of occasions in his book that a lot more time was spent getting the mono mixes correct as compared to the time taken over stereo. With his ability to interpret the sounds that John, Paul, George and Ringo had in their heads as they worked at getting their songs down on tape, Emerick made a huge contribution to their records. He wanted as much as they did to experiment – to take the recording process into new and un-charted waters. Here, There and Everywhere takes us into the famous Studio’s One and Two at Abbey Road as history was literally being made. Amongst other things we read about the antiquated attitudes, policies and equipment at EMI Records during the 1960s. Given their strict and old-fashioned rules it’s incredible that the greatness of the Beatles was ever captured at all. EMI management back in the day seemed stuck in the 1940s and 50s. As an organisation it frequently stood in the way of creativity rather than fostering it. It was Geoff Emerick who was willing to go out on a limb and flaunt the studio rules at Abbey Road to capture the sounds we have today. One of the other big surprises in the book is Emerick’s low opinion of George Harrison. There are frequent mentions of how stand-offish and surly Emerick found him to be, not to mention that he regarded George as a pretty lacklustre lead guitarist…. 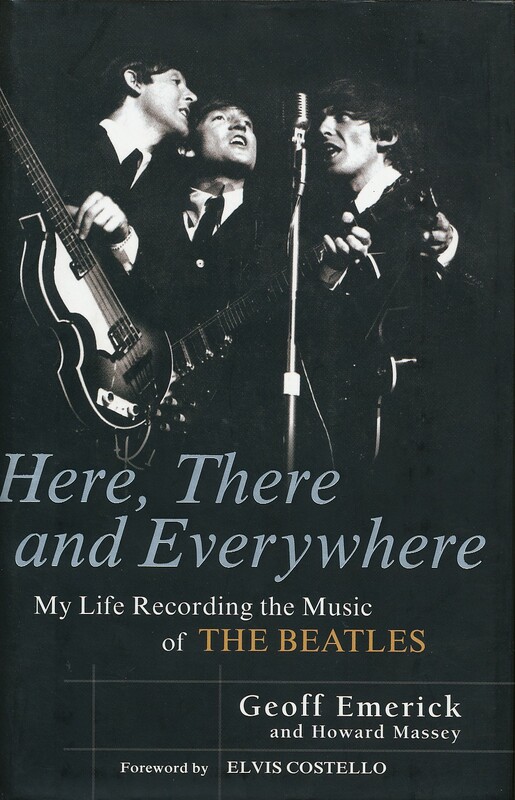 Here, There and Everywhere was published way back in 2006, but it is highly recommended if you are at all interested in the Beatles and their music. The copy we have is a signed copy. It’s not dedicated to us because this one is second-hand – but that doesn’t matter. 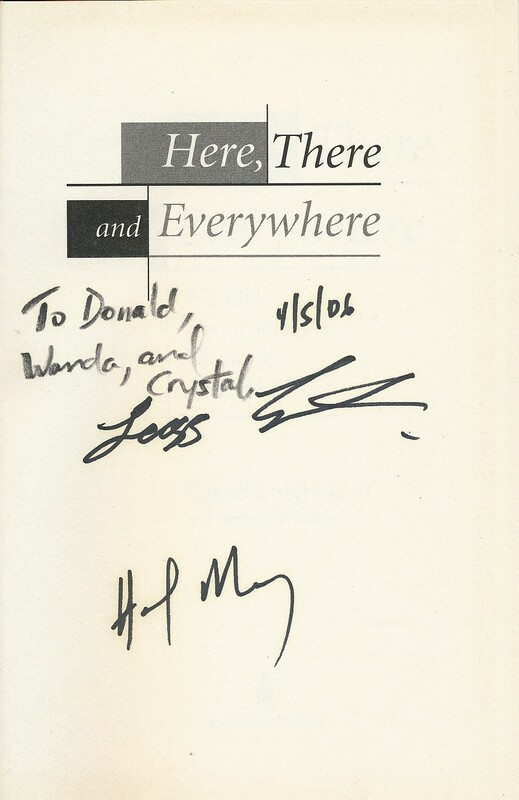 There is the signature of Geoff Emerick (and his co-author Howard Massey), a man who had a significant impact on the Beatles legacy. We wouldn’t have the Beatle canon without him.